Emotional Intelligence For Sales Success: Are You Too Independent? 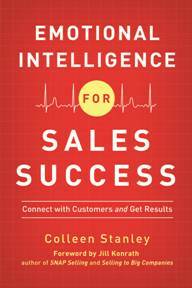 We are getting closer to the launch of our book, Emotional Intelligence For Sales Success. The team at SalesLeadership is excited to share this breakthrough sales content with you. Over the next few weeks, I will be giving you a sneak preview of the book, through blogs, sharing valuable information about the power of emotional intelligence in helping you close bigger deals, faster, at higher margins. Let’s start with the emotional intelligence skill of independence. This is the ability to be self directed and free from emotional dependency on others. Sounds like a wonderful attribute to possess in the world of professional selling. And it is; however, like any attribute, there can be a “cost” associated with this EI skill. The answers: A lot and a lot more. I can relate to this EI skill, because it is one of my stronger skills. I am proud of the fact that no one has to set goals for me. I am good at follow through on goals that I have set. But once I started studying emotional intelligence, I became aware of how much more I could accomplish if I would proactively reach out to others and ask for their help, their wisdom and their opinion. Due to wanting to get things done, I often didn’t ask for input because that might slow my decision making down! Here are two things I’ve incorporated into my professional development as part of this insight. I joined a peer advisory group called Vistage. This is a group of CEO’s that convene one day a month to learn from top notch guest speakers and each other. This group of business owners has knowledge in areas that I don’t and are very willing to share their expertise. The result is that SLI revenues have grown over 40 percent in the last two years. I formed a new habit of proactively asking for advice---even when I think I know the answer. (And that is all the time!) And every time I ask for input, I am reminded that I am not the smartest person in the room. The advice is often a small suggestion that yields big results. I just returned from a weekend conference called the Sales SheBang. Over 20 sales trainers convened to share best practices and ideas on growing their businesses. You might wonder why competitors would be willing to spend a weekend together. The answer is simple. The participants are smart, independent and also recognize they are not the “smartest person in the room.” They get and understand the power of collaboration and continuous improvement. As my old boss used to say, “Be careful with success. You might just start believing your own press.” Translation: Stay open to new ideas and concepts. Stop being the smartest person in the room. Independence is a great emotional intelligence skill. Just make sure your independence doesn’t hold you back from achieving your full potential because you don’t seek out the wisdom of others.